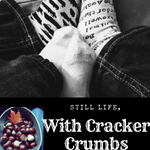 March | 2017 | Still Life, With Cracker Crumbs.. 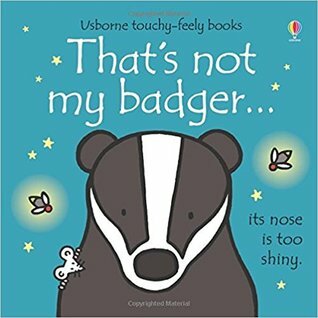 Somehow, we are a house obsessed with badgers. Well. I do know where it came from. Our little guy has cerebral palsy, and fights some every day tough battles. He is tenacious, relentless, determined. Tough. But seriously the sweetest kid you will ever meet. He loves snuggles and kisses and hugs and cuddles too. But he has a fighting spirit that has him doing so well in his four times a week therapies. I also do this “thing” where I imagine what spirit animal my family members would be if they were animals. Long story. Little man is a total badger. But a good one, not a grouchy one. Billy had read recently that stuffed animals are great for children and their development. That they offer an impartial ear, someone to commiserate with, play with. 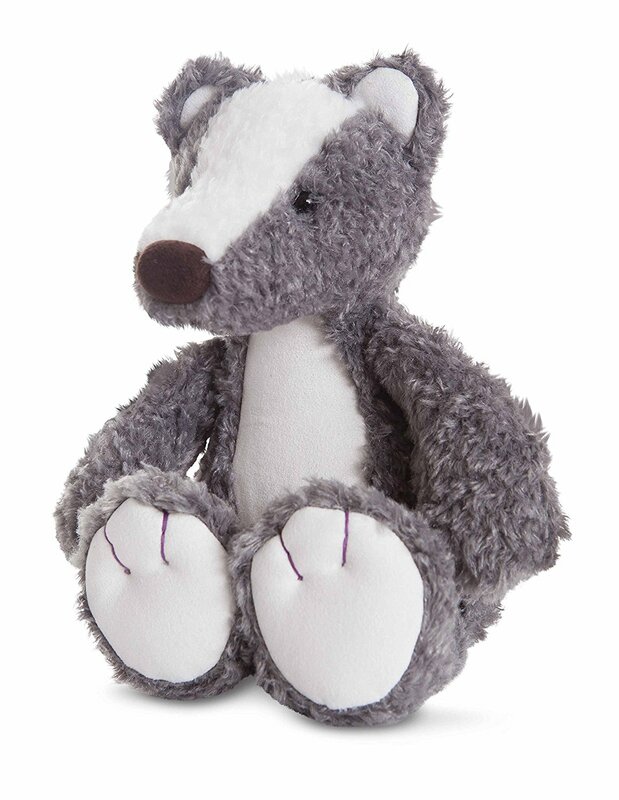 We decided the perfect little friend for our badger, was of course, a badger. 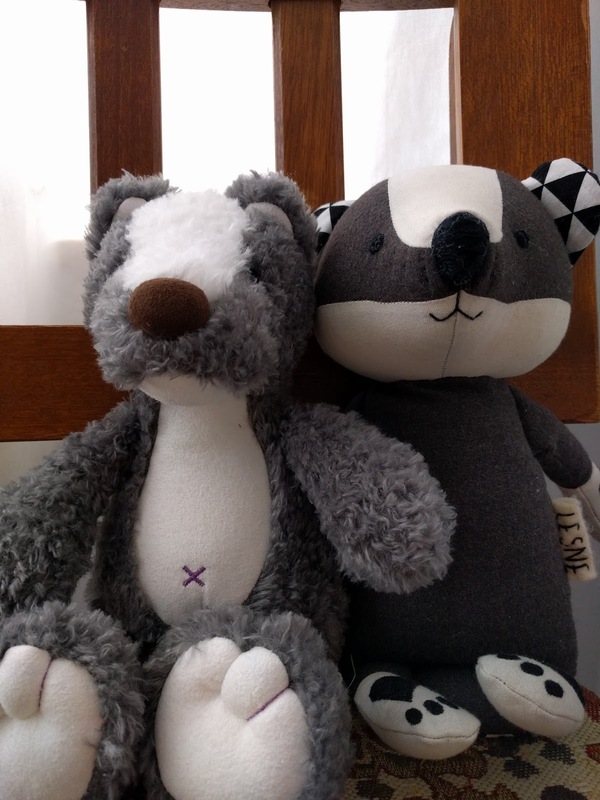 So we now have two stuffed badger friends for the boy. I call them his collection of International Badgers, as Edgar is from England. Around the same time, I found this. 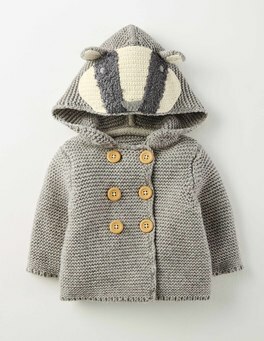 Because every boy needs a badger cardigan. (I got it from Mini-Boden at Nordstrom) We get so many compliments on it! 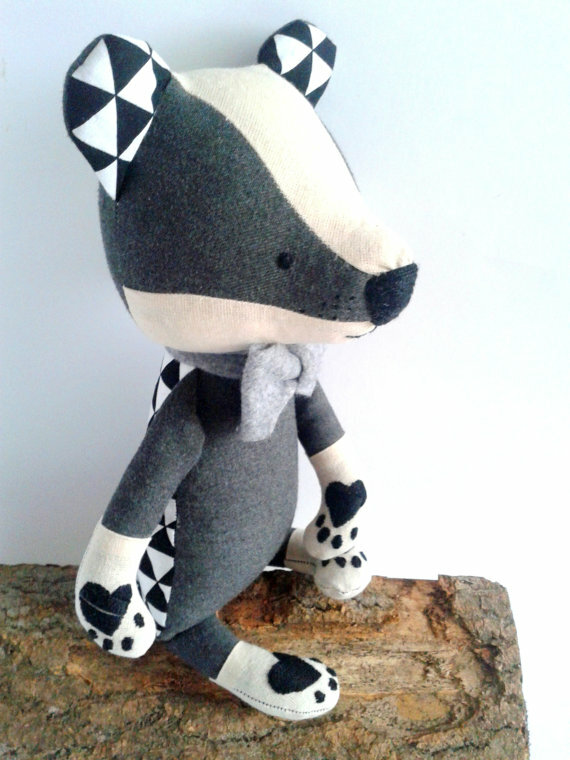 And now we are in love with badgers. 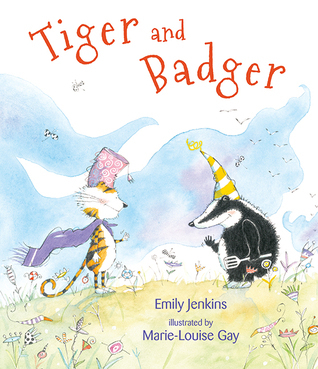 We have added two books to our collection, and are on the lookout for more fun badgery things! What about you? Any quirky collections or treasured items? And if you know of any badgers, let me know! Milk, Cookies, and Cake Please! 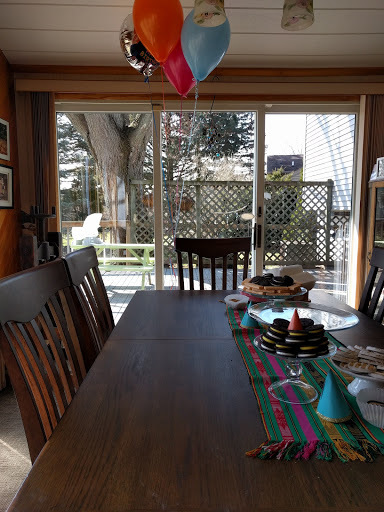 Birthday Party Time! Our big timer is two years old now! Time really does fly ~ I never believed it when people would tell me that once you have kids, time goes by so quickly, but it is very true. It seems like just yesterday he was a wee tiny baby, and now here he is, two! I was also excited because I felt like this was the last birthday I really could plan out on my own lol. Is that terrible? 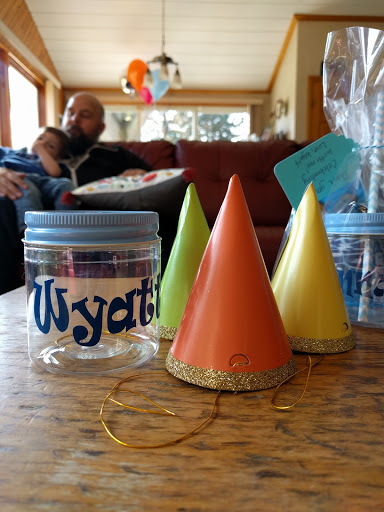 I have so many ideas for kids parties ~ but I am sure Wyatt will have his own opinion on things like theme. This time though, I had fun with a cookies and milk theme. When you look online, there are so many different ways to do this party, from elaborate to very simple. I went for a more simple version, I am kind of minimalist about things these days, but I am very happy with how it turned out! We had gone to Target the night before the party, and just picked up a few things. A few little decorative party hats, the cookies, festive birthday themed paper products, individual Horizon milks, flavored milk straws, and individual bags of Chips Ahoy, the latter two for the gift bags for the kids. I had decided I didn’t want to go too crazy with the milk and cookies theme, so I did a mixture of birthday with the cookies and milk, so it was more of a birthday party that included cookies and milk than a milk and cookies themed party, but everyone seemed to be happy about it, especially the kids. And seriously if you haven’t had a Birthday Cake Fudge Stripe cookie, I highly recommend them. And so does my two year old. I let him play with that elastic for about one second, which resulted in some quickly dried tears. Better than an injury though! The treat bags all had those personalized mason cup jars, with blue and white straws, which I picked up on Etsy from the store Mason Jar Party. I just thought they were so cute, and such a good price! You get a personalized set of 10 for just $19.99, and they are even BPA free! I just loved them. I love this photo, since the angle makes it look like the cake is ten times bigger than the boy. 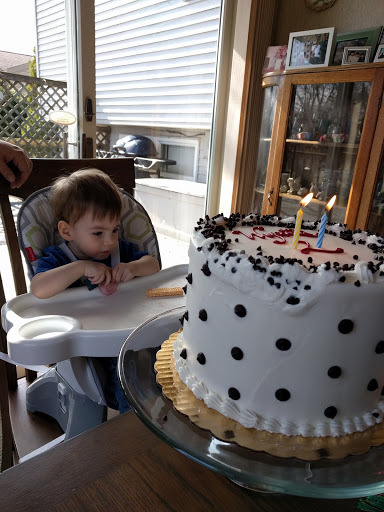 It was a huge cake, but not bigger than a toddler. Lol. It was seriously delicious. We ordered it from a nearby bakery, a real one, named Sorella’s, and they did a fantastic job. It was chocolate chip cookie themed, with chocolate chip batter, with Bavarian creme in between each layer. It was three layers of deliciousness! Bravo Sorella’s! 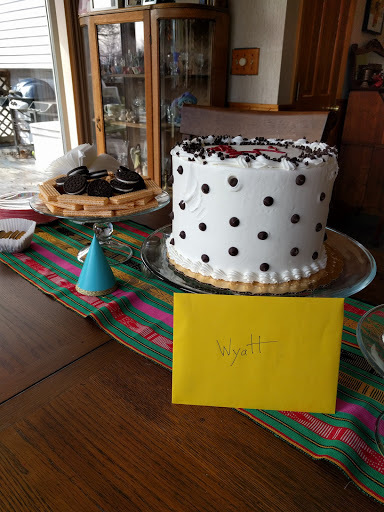 I have to say, I contacted a few bakeries regarding a cake, and two I never heard back from one and one outright ignored me when I went into the actual bakery. Sorella’s not only did a fabulous job, they also provided the friendliest service ever. They worked really hard to give us what we wanted, and they succeeded. They have a customer for life now! Everyone had such a good time ~ the kids had a blast playing with their milk mustaches that my mother in law made for them, and just being kids in general. 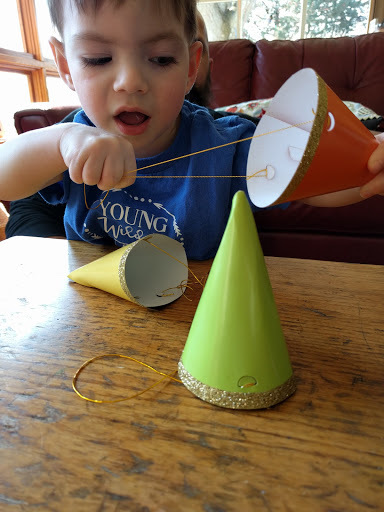 They came up with the craziest pretend games, imagining themselves to be unicorns, complete with a “unicorn horn” on their heads, made from what they found around the house and blue painters tape from a drawer. I love when kids play like that! The adults relaxed for the most part, munching on cookies, cake, pizza, and bread sticks. (If you are ever in Tecumseh you need to get Basil Boy’s bread sticks!) Wyatt was completely tuckered out by the end of the party, having had such a good time with his family. Which was exactly what I had wanted for him! 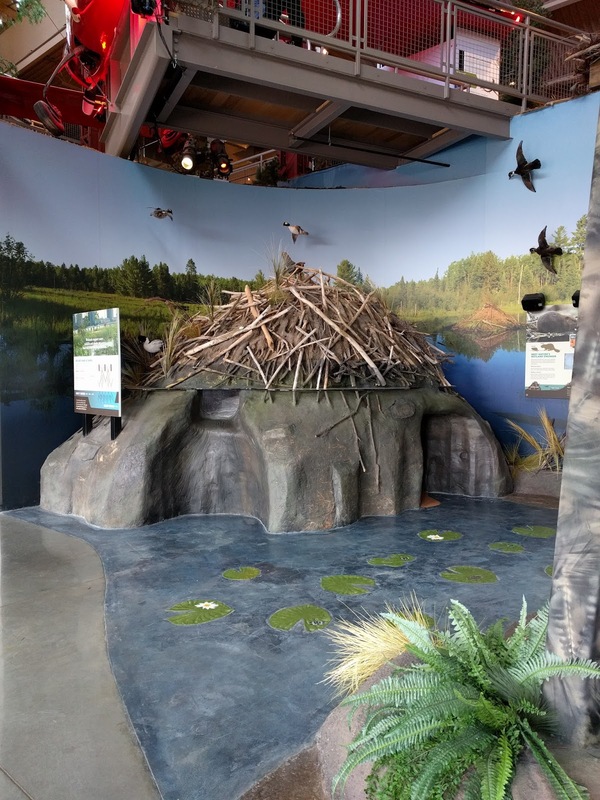 The DNR Outdoor Adventure Center in Detroit was designed to bring “up north” to Detroit, and it really captures the spirit of being outside, while teaching about the natural resources and treasures that can be found in our state. 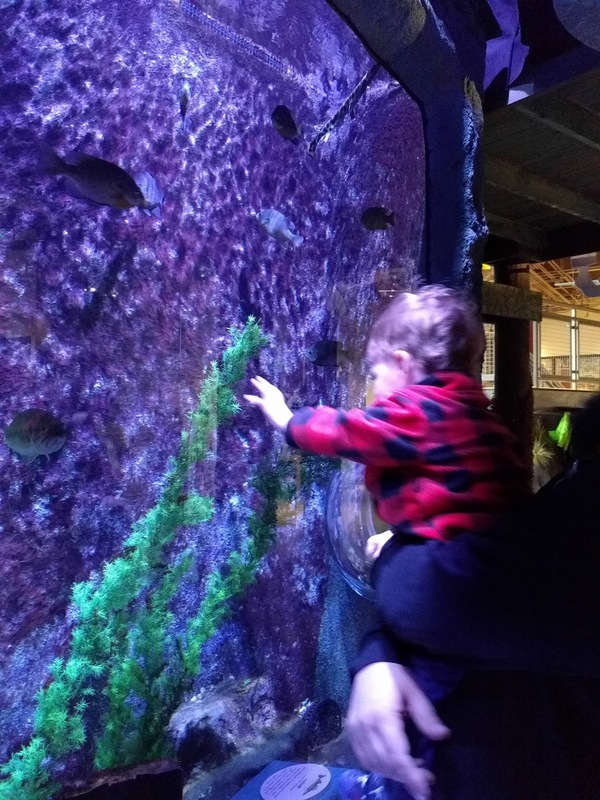 We had been wanting to visit for a while, and we decided it would be a fun little excursion for our family to celebrate Wyatt’s second birthday. As you walk through the OAC, you are introduced to all the different natural resources and landscapes that make up the state of Michigan – water, sand, forest, flora, fauna. I didn’t take photos of everything, but you get to “explore” the watery world of the Great Lakes and Michigan’s rivers, complete with a simulated kayaking ride and simulated fishing, stand in a giant yurt and learn about the many camping opportunities that abound here, stand behind a giant waterfall, explore a mine (Detroit has huge salt mines), learn about the sand dunes, and duck into a beaver dam exhibit. 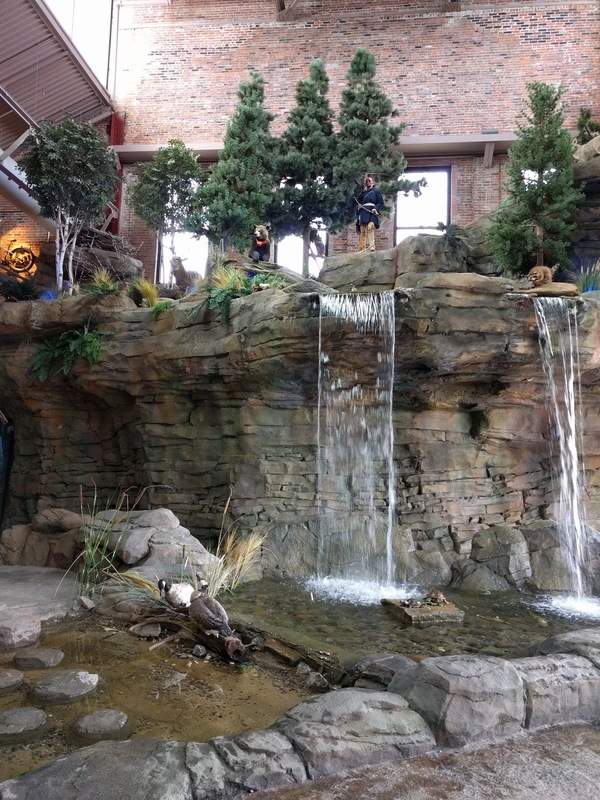 The waterfall was a big hit with Wyatt, as was the aquarium. The waterfall was my favorite part too. 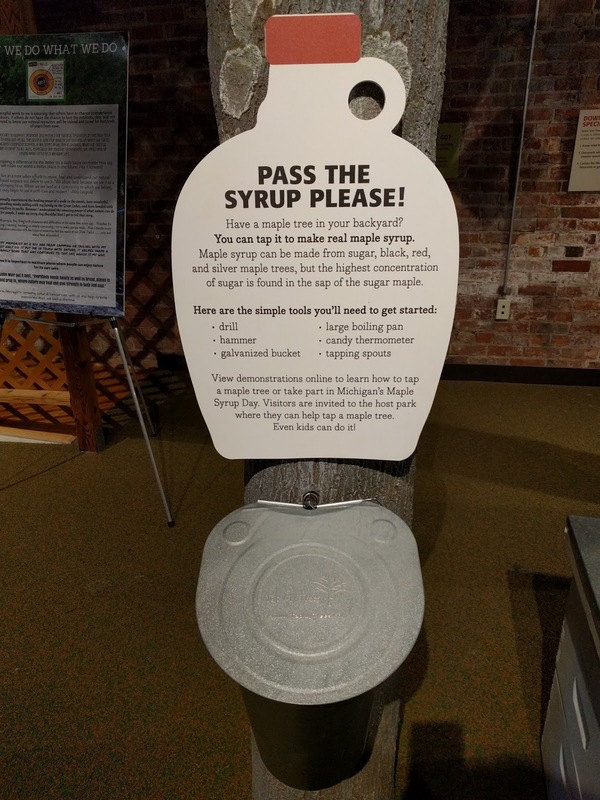 The second floor gave kids the opportunity to stand in a giant duck blind, a prop airplane, and learn about different natural resources, including maple syrup! There was also a nice display about Citizen Science, which I thought was really cool. When we were walking around there was a small school group visiting, so we couldn’t get too close to some of the exhibits, but they seemed to center on hunting, which I was fine with skipping. 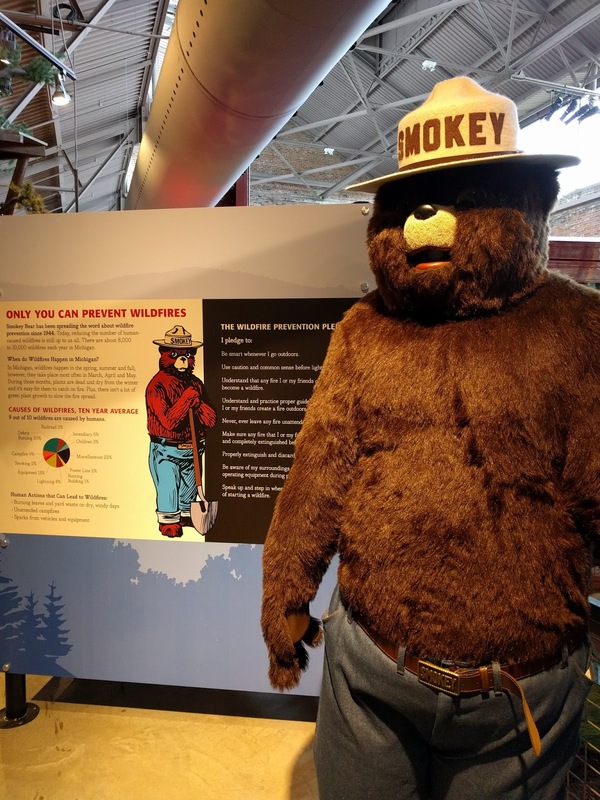 So was Wyatt, who was just a little freaked out by the taxidermied animals ~ including Smokey. After exploring the upstairs, we headed back down and hung out in the play area, which included a giant tree that kids could “climb” to the second floor, and a slide. It was really neat, for a bit older kid than my guy. We enjoyed hanging out around the faux campfire in the Michigan shaped Adirondack chairs though. The fee for entry was only $5.00 for adults, $3.00 for kids two and up, and is a great place to take kids, especially in the cold blah of winter. We left having learned a few new things, and inspired to take a possible small camping trip this summer, which I feel might turn into staying in a cabin near wilderness, rather than in a tent, but close enough for now, right? It was also a nice reminder of the natural treasures that make up Michigan. If you are ever in the area, I recommend popping in for an hour or two! We had a great time.